Several of the Turkish Airlines EuroLeague's top performers have made huge strides in scoring efficiency from a year ago. A lot of different factors effect offensive and defensive efficiency for any given EuroLeague player. Role, personnel rotations, and tactics on both sides of the court often change game to game, let alone season to season. Despite all those variables, some players make big strides that are seldom difficult to find. Whether they make more jump shots, improve their pick-and-roll decision-making, or develop into a more opportunistic finisher, there's no shortage of ways in which EuroLeague players evolve over time. 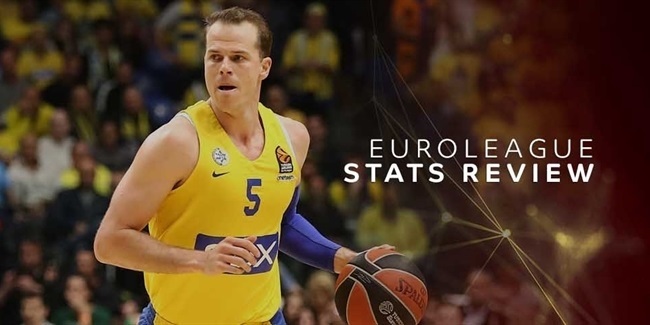 Among the 88 players who have used over 5 possessions per game both this and last season in the EuroLeague, 41 have scored more points per possession during the 2018-19 campaign. Only seven of those players made an improvement of 0.15 points per possession or more. The list above features the six players who have made the biggest jump in offensive efficiency from last season. Stefan Markovic is a prime example of what this list is looking to capture. Playing a similar role each of the last two seasons with Khimki Moscow Region, Markovic has made clear strides as a set shooter. He connected on 28% of his catch-and-shoot jump shots within Khimki's half-court offense last season but has converted 44% this season. Shooting 25% from beyond the arc over his three prior EuroLeague seasons, Markovic has found his range this season, connecting on 40% of his attempts. For players like Markovic, improvement can be easily summarized in a single play or shot type from the Synergy Sports Technology database. But for players like Kostas Sloukas, it can be a bit more complicated. His role with Fenerbahce Beko Istanbul is a bit smaller than it was a year ago, but he's scoring more points per game anyway. He's attacking the rim less frequently, with 11% fewer shots coming in finishing situations, but his shooting percentage has risen from 54% to 68% on shots inside as a result. He's also making 52% of his catch-and-shoot jumpers, up from 39% a year ago. Sloukas is no stranger to strong shooting performance, having made more than 40% of his three-point attempts during several seasons of his career. However, he's never been more accurate or opportunistic with or without the ball from the paint or the perimeter in his career as this season. Krunoslav Simon is a tremendous example of what kind of impact environment can have on individual performance. Anadolu Efes Istanbul was the EuroLeague's least efficient offensive team a year ago, but currently sits second in points per possession. Simon has contributed to that making floaters, layups, and jump shots far more efficiently than he did a year ago, but part of the reason he's been able to do that is because more of those shots have been open as a result of the team's dramatically superior spacing. Able to pick and choose his spots more comfortably off the dribble, with fewer defenders in the paint, Simon has thrived as a scorer in the pick-and-roll this season. Real Madrid center Anthony Randolph's improvement can be chalked up almost entirely to his sudden and significant development as a perimeter shooter. A season ago, only 34% of Randolph's shots in the half-court were catch-and-shoot jumpers, which he converted for 1.10 points per attempt. This season, 53% of Randolph's shots in the half-court have come on the perimeter and he's scored them for 1.53 points per shot. Not only has Randolph provided better value as a floor spacer, he's emerged as a viable shooter on the move, which is virtually unprecedented for a player his size at any level of basketball. Randolph currently ranks 12th in the EuroLeague in off-screen scoring, sandwiched between a pair of players with lengthy resumes as shooters: Scottie Wilbekin and Luigi Datome. Among the players listed above, Will Clyburn is perhaps the best example of what experience can do for a player. A gifted athlete, Clyburn has found a comfort level utilizing his physical tools more consistently in his third EuroLeague season. Clyburn actually made a higher percentage of his jump shots a season ago than he has in this one but has seen his scoring efficiency climb due to his development into one of the competition's top scorers in transition and in post-up situations. After shooting a serviceable 62% in transition and 42% when posting up a year ago, Clyburn has converted a remarkable 83% and 79% of his attempts this season, respectively. His, comfort level with the speed of the game in the EuroLeague and understanding of how he can use his physicality have grown in a major way this season. 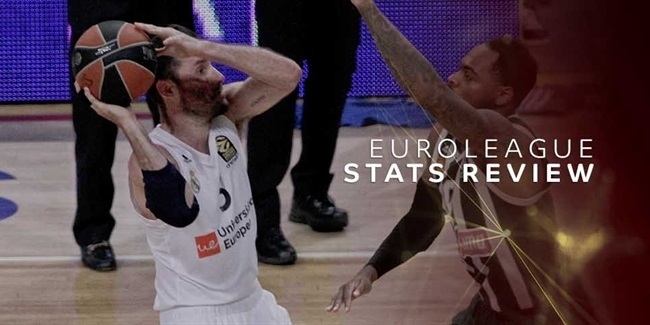 Real Madrid swingman Rudy Fernandez has had no shortage of success in his lengthy EuroLeague career, but the 33-year-old has had a resurgence of sorts from the perimeter this season. After scoring 1.07 points per spot-up possession a year ago, Fernandez is averaging 1.42 points per spot-up possession this season while also proving more accurate shooting on the move in Real Madrid's off-screen, action-heavy half-court sets. A career 36% three-point shooter in EuroLeague play, Fernandez is having by far his best shooting season, sinking 47% of his attempts from beyond the arc through Round 19 in his eighth season in Madrid. Even for the most seasoned veteran, there are still opportunities for improvement. It is not at all surprising that many of the players above are having career years from the perimeter, because three-point shooting has driven EuroLeague efficiency to new heights in recent years. The different positions and situations those players come from reveals how expectations have changed for players across the competition as many of the league's top contributors continue to evolve and adapt on the floor to meet the league's increasingly efficient standards.